Look at the shapes on the boxes across the rows and up and down the columns. Do you see how they are related to each other? Can you find the answer that goes in the empty box so the designs inside the rows and columns follow a pattern? 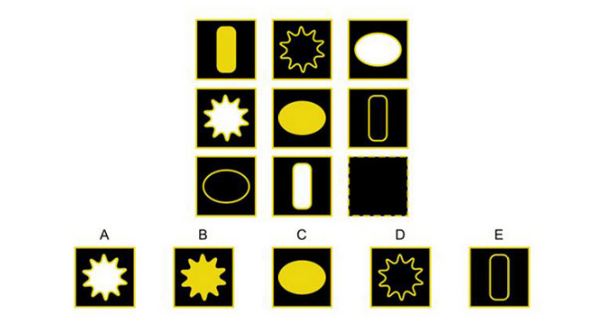 The Naglieri Non-Verbal Ability Test® is a common gifted and talented test used to determine whether children should be admitted to advanced programs. 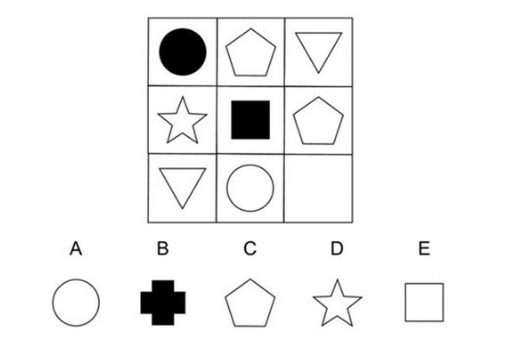 The test is a matrix exam that uses diagrams and shapes to test a child’s non-verbal test. One of the good things about the test is that it’s unbiased since results won’t be skewed by whether a child’s first language is English. When should I start preparing my child for the NNAT3 test? It’s best to start preparing as soon as you can. If you’re able to give your child a running head start they’ll have a much better shot at making a passing score, especially for a competitive test like the NNAT3 test for second grade. The reality is that often you won’t find out your child is being tested until just weeks before the exam. If this is the case, you still have plenty of time to give your child an advantage by familiarizing them with the underlying skills they’ll need to do well on the exam. Is it better to use hard-copy materials or online games? If possible, it’s a good idea to have your child work with a mix of materials. This will ensure that they don’t get burned out preparing for the NNAT test for second grade, and that test prep is actually a fun time for them. Especially if you have plenty of time to prepare, it’s great to use a variety of materials to get your child geared up for test day. My child is shy. How do I prepare them to take the test when I can’t be there with them? Many shy children struggle with test taking since, often, their parents can’t be in the room with them during the exam. If this is the case for your child, you’ll want to get them comfortable with the idea of being without you during the NNAT3 test for second grade. Have them talk to adults in safe settings long before they step foot in the exam room. The next time you go to the grocery store or coffee shop, have your child order for you or engage the cashier at checkout. This will go a long way toward bringing your child out of their shell. Look at the shapes in the boxes across the rows and up and down the columns. Do you see how they are related to each other? Can you find the answer that foes in the empty box so the designs inside the rows and columns follow a pattern or rule? What is the NNAT3 test? NNAT®3 and Naglieri Nonverbal Ability Test® and Raven’s Standard Progressive Matrices™ are trademarks and/or registered trademarks of Pearson Education, Inc or its affiliate(s), or their licensors. TestingMom.com is not affiliated with nor related to Pearson Education, Inc or its affiliates (“Pearson”). Pearson does not sponsor or endorse any TestingMom.com product, nor have TestingMom.com products or services been reviewed, certified, or approved by Pearson. Trademarks referring to specific test providers are used by TestingMom.com for nominative purposes only and such trademarks are solely the property of their respective owners. NNAT-2® and NNAT3® and Naglieri Nonverbal Ability Test® are trademarks and/or registered trademarks of Pearson Education, Inc or its affiliate(s), or their licensors. TestingMom.com is not affiliated with nor related to Pearson Education, Inc or its affiliates (“Pearson”). Pearson does not sponsor or endorse any TestingMom.com product, nor have TestingMom.com products or services been reviewed, certified, or approved by Pearson. Trademarks referring to specific test providers are used by TestingMom.com for nominative purposes only and such trademarks are solely the property of their respective owners.